For 80 years, Ameda has been a leader in the breastfeeding and breast pumping world. 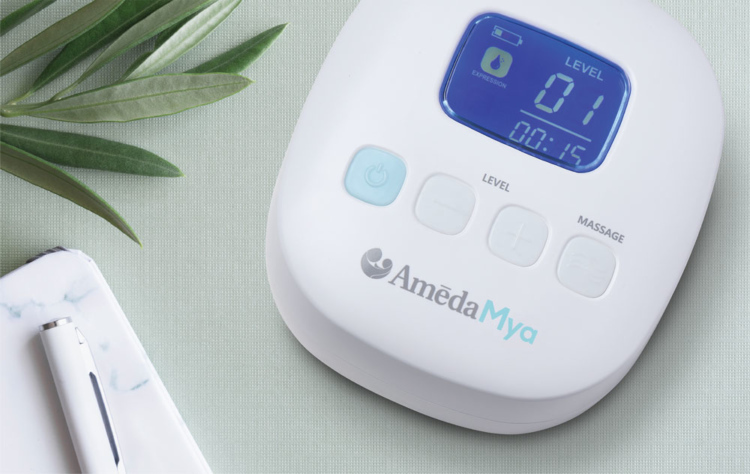 From the beginning, Ameda has been dedicated to improving the breastfeeding experience of moms nationwide, and the latest innovation is the brand new Mya breast pump. The Ameda Mya is a breakthrough hospital strength portable breast pump that is compact without compromise. Mya is small, super lightweight, ultra-quiet, and can be operated by a rechargeable battery. Mya offers moms a convenient, safe, discreet way to provide their babies vital nutrition with a new level of freedom. Whether it’s work, travel, running errands, or just having a night out, Mya is the easiest way to pump on-the-go. Find out if you’re eligible for a Mya breast pump through your insurance. The Mya breast pump is getting rave reviews. Check out this review from a board-certified lactation consultant. “It was SO small, and so powerful, that I basically put it in my pocket while I tossed a salad for dinner, with the flanges in my pumping bra and was LITERALLY done before I knew it,” she says when talking about the tiny Mya breast pump. With the Mya, pumping took about 11 minutes when it usually takes 15 for the same result — amazing! Now available at Edwards Health Care Services, the Mya comes in two configurations: the pump only and pump with a tote. Both Mya configurations are covered by insurance, but the pump-only configuration is typically covered at 100% while the pump with tote and accessories is often available with an upgrade fee. Our staff of breast pump experts can help you determine if the Mya is the right pump for you.